This all new shaker cup features major improvements over models – manufactured from stainless steel, it is much less prone to denting than other cups which are typically made from aluminum. Also, new wide-mouth design makes catching easier. Internal rubber spacer keeps cups separated for easy throws. Spacers are affixed to the inside of cups using no bolts, rivets or other hardware. Highly polished finish. 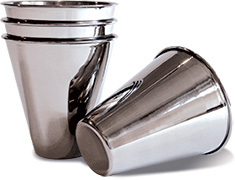 #2310 Shaker Cup - Stainless Steel $19.95 ea. Maks shaker cup routine using Dubé Shaker Cups.